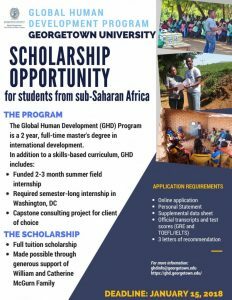 The Global Human Development Program (GHD) at Georgetown University’s Edmund A. Walsh School of Foreign Service is excited to announce a full tuition scholarship for a master’s-level student from sub-Saharan Africa, made possible through the generous support of the William and Catherine McGurn Family. In addition to the curriculum, students apply the skills and knowledge they are learning in the classroom to three different professional work experiences: the summer field project (a fully-funded 2-3 month international work placement); an internship at a relevant Washington DC-based international development organization/agency for at least one academic semester; and the capstone project (a two-semester client engagement project emphasizing project management and analysis). As GHD is a practitioner-focused program, competitive applicants must have at least two years of experience working in international development or a related field. 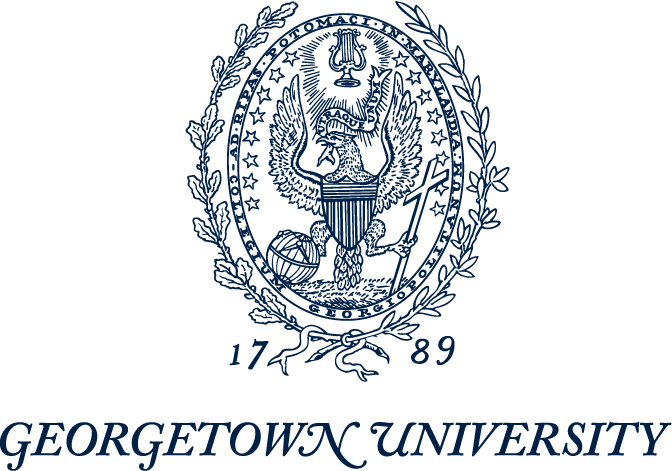 All applicants must have completed an undergraduate degree prior to proposed enrollment. The scholarship will be awarded based on the overall strength of the application. The deadline for admission is January 15, 2018.